Chester County Poorfarm site. Page 2. 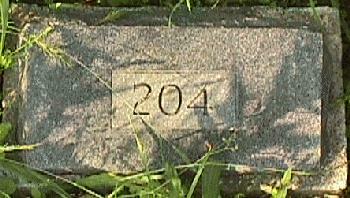 Pictured is tombstone #204 of the lot that is buried here. All of the 204 stones are accounted for at this site. They are laid out in uneven rows and about a foot and a half apart. Unless there are stones missing above 204, we are left with 204 residents. This is where the research meets the proverbial "Stone Wall". I contacted the county concerning this cemetary and to whom it is in the care of and I was told it as under the supervision of the local hospital for the handicapped. Having prior dealings with this hospital in the past over unrelated matters I contacted them. I informed them that I was interested in researching this site historically and environmentally. They said that it shouldn't be a problem as long as nothing was disturbed.(ex. no digging, uprooting, or the like) I explained that this was not what we do (after all we are not a cult) and they said it shouldn't be a problem. I then went about setting up the on site research and I was contacted by beeper of all things by the caretaker of the hospital. I was then told that we were explicitly NOT givin any permission to research or be on site for any reason. That if we went on site we were tresspassing and we would be breaking the law. I then asked them why this sudden change of heart, and the reply was that they didn't want to be liable if anyone got hurt, (This is a common attempt to stone wall in our line of work). I then offered up a release of liability signed by all of the researchers. Their reply was that,"Something like that would have to be made up by a Lawyer and would be expensive." I explained that we had a lawyer who would draw something like that up for us at a minimal expense and could give them that. Their next response after a long hesitation and conferring with someone on the other line was that we would have to post a Bond in value of a Quarter Million dollars! After long staring at the phone in my hand, I asked what this was for. The answer was if anyone got hurt, this would be for that. Honestly I have not a clue why they would need that if they were in possesion of a release of liability. Our lawyer friend had no idea either. After this game of run around came to a hesitation, I asked if they had a problem with us researching the ground historically. They said they didn't as long as we didn't enter the premises. I asked if we could get a list of the corrosponding numbers to the grave markers. We were told "No". "It is a matter of privacy for the families of those buried here." A matter of privacy? This graveyard dates back to 1800 and they are still concerned with privacy? What about these peoples identities? Are they no longer entitled to their names, or their history. This due to someone who they are related to, who left them here, wants to leave their mistakes buried? Are these people's rights in Potter's Field NOT as important as the people in their own family? Other's see 204 stones stitting in an overgrown field out of the way of everyday life and safely tucked away. I see 204 people who are literally screaming from beyond the grave to get back the one thing we are all given which is never to be taken away. We may lose everything in life from our loved ones, to our fortunes, to our own lives. But the One thing we are given at birth is our own names! We carry these through our lives, for better or for worse. Still they are ours! Our entire history is eveloped in those names. These people were seen fit to lose their names, and be assigned a number. Look at this marker. It has no name, date, epitaph,or any other information on it. It merely states one thing. This person was the 204th person to be buried here! We have a Tomb of The Unknown Soldier that stands in Washington. Here we have a rock with foolish numbers. It's one thing if you don't know the identities of those buried here. It's another to intentionally hide them. This is the reason why I'm interested. These people are not embarrasments, they are PEOPLE.